Update: A few people have commented that without alphabetical order it is difficult to pick out a tag you are looking for. Personally I have never used a tag cloud like that, its usually just a starting off point to explore the site. If I wanted something specific I would use the search function. Even if the tag-cloud is used to scan for specific tags, it becomes redundant if you have so many tags that you can only show a subset, which is the case for becontrary.com. So I chose form over function, consequences be damned! I agree, sorted does look nice. It gives your readers a much better idea of what to expect right up front. so much more useful - depends on the beholder/user, and is also affected by how many items your tag list contains. A short list, presented in a narrow format, can be taken in easily by many readers, but as the list grows, this won't be the case. A long list of tags ordered by weight rather than alphabetically become cumbersome if one's purpose is to find a specific tag rather than select tags by weight. 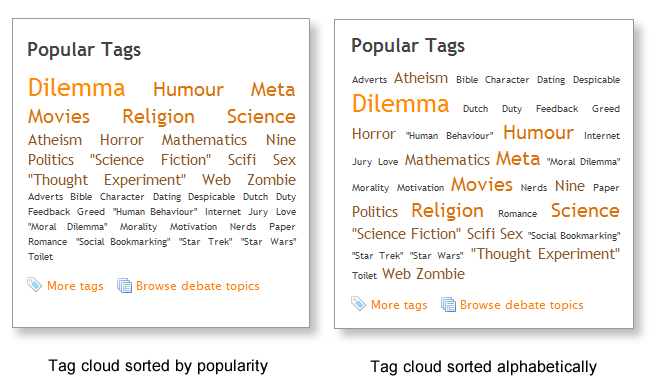 If you sort your tag clouds by popularity, there is no reason at all to make the more popular tags larger. Jerry, how would you know which ones are more popular without differentiating them visually somehow? They could all be the same popularity, for all the reader knows. Well, if they're sorted by popularity, then the first ones in the list are the most popular. Not necessarily. A tag may have the same popularity as a tag preceding it, and there would be no way of telling that visually. A sorted-alphabetically list has 2 main benefits. 1) You can see what's popular at a glance based on the size of the items and 2) You can find a peticular tag in the cloud because it's sorted in a meaningful way. The problem with sorted-by-popularity is that it's only useful in 1 way. Namely the 'what is popular' way. But it completely obfuscates it's use in any other way (say 'I want posts about Ruby, where is that'). Aesthetically, you might be right, of course. But functionality wise, you're destroying part of the purpose of a tag 'cloud'. Consider this. If it's just in order of popularity why not just list the most popular tier in a straight list instead of in a 'cloud' formation at all. Sorting looks good but actually removes order from the list. The philosophy of tag cloud is that what is popular is also big. You make this information redundant by also placing popular things to the front. If I'm searching someones weblog/website and use their tagcloud, I'm looking for specific keywords. My brains want the list to be alphabetically sorted, so in a blink of an eye I 1) can find the keyword and click on it and 2) if the keyword is not there I know it's not used while sorting on popularity means I still have to scroll through the rest of the list. So....sorting on popularity: bad idea. You're duplicating information. Text size/color already defines popularity. Lack of predictable sorting makes it much harder to find a specific keyword. ryan's right. Pretty comes second to utility. A user needs quick access based on collating order, and some indication of frequency, e.g. font size, is nice. You could try ordering by frequency and use appearance to indicate collating order, e.g. a colour fade from green to black. Can you quickly locate a particular word then? I really don't think it looks prettier and ends up losing the whole "cloud" feel. I'm 100% against the idea of sorting by popularity! I don't really use clouds very often, but part of the appeal to me is that they looks a little "bumpy". While working on http://drupal.org/project/nodecloud I played around with a lot of different sorting algorithms. I actually really like sorting such that the most popular items were in the middle. It had a wonderful "balloon" effect. Worth a try if you want alternate cloud making algorithms. I'm all for sorting by popularity. The only utility of alphabetical sorting is for locating a tag, but in most modern browsers you can hit '/' to find it. Heck, I even do that when it *is* sorted alphabetically. This is a kind of a non-argument isn't it? If people feel strongly about it, simply provide a link to allow the user/reader to re-sort in accordance with the desired criteria. I had no idea this would be such a contentious topic! Perhaps it should have been a becontrary debate. Michael, thanks for bringing that to my attention. Perhaps upgrading Wordpress will fix it. It definitely seems interesting, but I would count myself among the people who look at both size and alphabetization. After all, with a traditional tag cloud, the size, not the ordering, indicates the popularity, while the ordering can be used as basic indexing/sorting. Whether you care or not about duplicating information you should at least realize that it is no longer a "cloud". Clouds are supposed to be random and fussy not neatly sorted, it is more of a "tag rainbow" or "tag stalactite". Regardless, fuzziness was part of the aesthetic, you just missed the point. Requiem, it is clearly a 'tag waterfall'! Right, it looks better, but it is no longer a tag cloud. It's just a listing by popularity, with sizes. Now, I personally prefer this if this is what you want to convey. And if you want to have an alphabethical listing, and still convey popularity, maybe just listing them in different sizes? For me, standard tag clouds are just hard to use. The different sizes break up the flow, and make the alphabetical ordering unusable.